This week, pollution in Bangkok reached dangerous levels. As the government rushed to implement short-term fixes, Bangkok is left crying out for a dynamic, government-wide approach to tackling pollution. Bangkok has been blanketed in a cloak of smog in recent weeks, with its air quality index (AQI) soaring to unhealthy levels. On Monday, Thailand’s AQI reached 180. Anything above 150 is considered unsafe for residents. The culprit behind the sudden deterioration in the quality of Bangkok’s air quality was a significant increase in the concentration of PM2.5, harmful microscopic particles caused by excess pollution. The largest source of PM2.5 is the scores of cars, trucks, and motorcycles navigating Bangkok’s asphalt arteries every day. Dr. Nuntavarn Vichit-Vadakan, the founding dean of the School of Public Health at Thailand’s Thammasut University, explained to ASEAN Today, “car and motorcycle sales increase each year, so there are more vehicles on the road.” These vehicles create as much as 60% of the PM2.5 present in the air. Farmers burning biomass in fields outside Bangkok also contribute to the increase in PM2.5. Burning crops and waste accounts for an estimated 35% of PM2.5 emissions. Thailand’s dry season, which typically lasts between April and November, leads to increased air stagnation in Bangkok. Coupled with the high levels of pollution, this created the conditions which caused a blanket of smog to gather across the city. 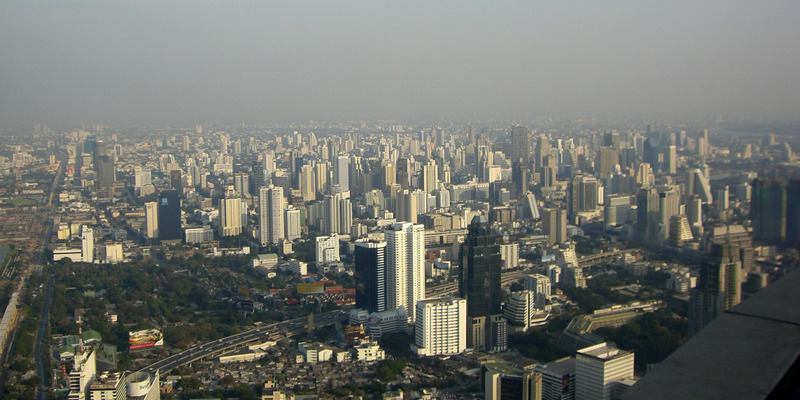 The deteriorating air quality in Bangkok will have a sizeable impact on public health. The tiny PM2.5 particles are small enough to get into the bloodstream through the lungs. From there, they can cause a host of respiratory issues, including cancer. In a 2011 study, Nuntavarn Vichit-Vadakan and Nitaya Vajanapoom found that for each 10 microgram per cubic metre increase in PM10 particles, of which PM2.5 accounts for roughly 60%, Bangkok’s mortality rate increased by 1.25%. The World Health Organisation (WHO) sets recommends nations keep the concentration PM10 particles in the air below 20 micrograms per cubic metre to maintain safe levels. The EU advises nations to avoid exceeding 40 micrograms per cubic metre. In recent weeks, Bangkok’s PM10 concentration peaked at 120.5 micrograms per cubic metre, more than six times the WHO’s recommended safe concentration. Alongside the health implications, the deterioration of air quality will have far-reaching economic repercussions. Witsanu Attavanich, an associate professor of economics at Kasetsart University found that every microgram of PM10 beyond the safe limit costs an estimated Bt18.42 billion (US$580 million) in medical bills. Despite the government’s insistence there is no air crisis, it has implemented some emergency measures in an attempt to ease pollution. On Monday, the city positioned water cannons to fire water into the air. The government also handed out 10,000 masks to the city’s residents and trucks were banned from the city’s central districts. Then, on Tuesday, the Royal Thai Airforce sent two planes from the Northern part of the country to Bangkok to spray the air with water. Spraying water in the air is an effective way to bring PM2.5 levels down rapidly. However, along with the other measures implemented by the Thai government, it does nothing to address the root causes of pollution. To really tackle Bangkok’s seasonal pollution, the Thai government will need to implement a government-wide initiative. The Pollution Control Department does not have the capabilities of tackling the issue alone. A dynamic solution involving the promotion of cleaner fuel sources in the transport sector, increased investment in reliable public transit solutions, and the allocation of more urban land for greenspaces and parks are beyond the Pollution Control Department’s remit. But they are essential for ensuring a safe, clean future for Bangkok’s residents. Improved monitoring and tighter government regulations surrounding industrial emissions must also come into effect. With more dry weather forecast, the problem will likely persist. Even when the dry season ends, and the rains bring a welcome respite to the lungs of Bangkok’s 8.3 million residents, the episode should provide the Bangkok Metropolitan Administration (BMA) with a lesson: get serious about tackling pollution, acknowledge the threat to public health and the local economy pollution represents, and mobilise every arm of local government to implement strategies to improve Bangkok’s air quality. If the BMA doesn’t take heed, Bangkok’s smog blanket will become an annual visitor to the city, one that brings death and disease in tow.